Who invited that hot dog?! This post is really just a recommendation to make the topping and skip the hot dog. The topping is completely delicious. I didn’t think that cooking corn (I used defrosted frozen stuff) in a dry skillet would actually make much of a difference for flavor. I was so wrong. The browning brings out the sugar in the corn, making it the perfect foil for all of the other sour ingredients. I think I overcooked my corn a little, though. The recipe says to roast the corn in a dry skillet until it is browned, then add oil and scallion greens, and cook until the scallions are soft. Well, the corn doesn’t magically stop cooking once you add the oil and scallions, so I cut this whole process off before the scallions were cooked because the corn was edging from brown to black. That having been said, it was delicious. I think I would brown the corn by itself until it is very nearly fully browned, then add the oil and scallions to brown it the rest of the way while the onions cook. I wound up absolutely loving the corn topping, dressing, everything. So I was super excited to eat the hot dog. Here’s roughly a transcript of what went on in my head with each bite: “whoo hoo! Corn! Lime mayo! This is awesome! (chew, chew) Oh, yeah, hot dog. Huh. Bun. Yeah…ok, I guess.” Then I’d take another bite and repeat that. The hot dog and bun really got in the way of the salad. Unlike the banh mi dog where the hot dog added some salt and umami to the other flavors, here it just seemed like an afterthought. So just serve the salad as a side with a hot dog that you dress as you please. Curious how I prefer my hot dog? I thought you’d never ask. I like it with cheap yellow mustard, corn relish, and raw onions. Actually, I once had that hot dog with homemade pickled watermelon rind added on and it was perfect. 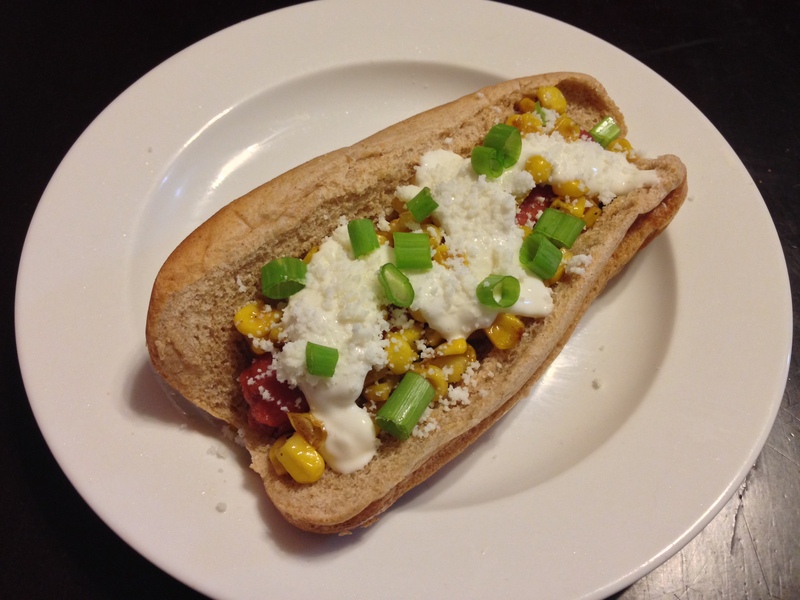 That would be my ultimate dog…with this corn salad on the side. On the other hand, you could just grill corn on the cob on the grill and dress it with the lime mayo, Cojita cheese, and chili powder. That would probably be the best of the best. That cheese, by the way, tastes almost exactly like feta. I’ve also had corn dressed this way with freshly grated Parmesan. That works too. Well, not the dish soap. Anyway, I had planned to take pictures at every major step. Then I spilled hot chicken broth all over my brand new phone and convinced myself to focus on cooking. The end result? 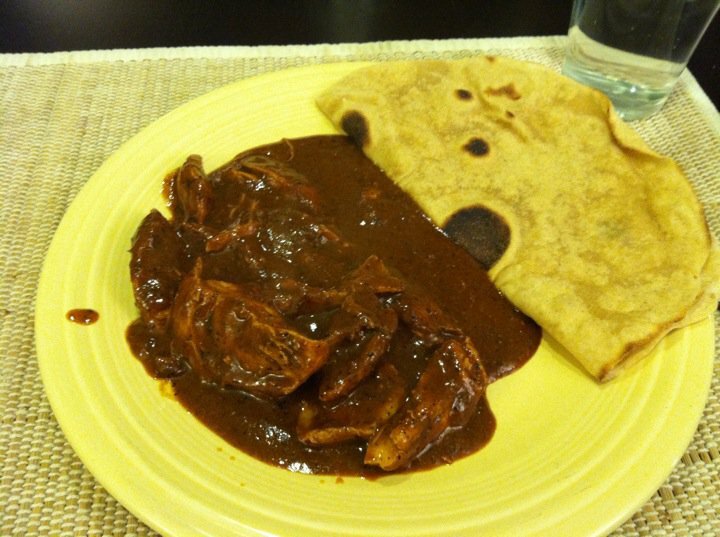 My friend Katie contributed homemade tortillas and was paid in mole. It was a good trade. Man, was that good. It was such a hassle to fry and blend and cook and wait and fry and worry and wait some more, but oh my was it good. Which is why I was so conflicted about this recipe. On one hand, if it’s just as good, then I’ve found a way to short-circuit 6 hours of madness using the slow cooker. On the other hand, if it’s just as good, then my great culinary triumph was roughly on par with making a pot roast. Thus, I am equally disappointed and relieved to tell you, dear readers, that this is in no way as good as real mole. What it was missing was the depth of flavor. This recipe is like a cheap bottle of wine: the flavor is pretty much there, but it’s not as deep, not as complicated. Which is not to say that this isn’t good. It is. 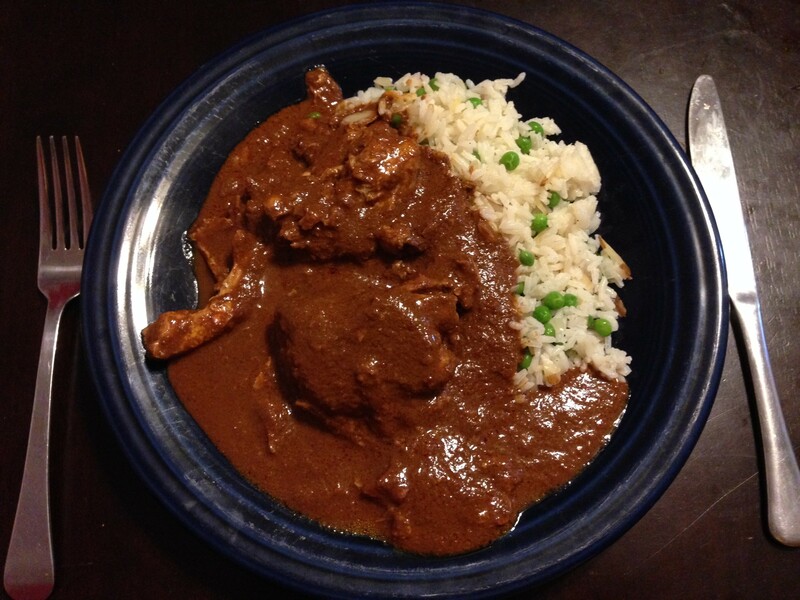 This is a fine recipe for what I’m forced to call imitation mole. And it’s exceedingly easy. The pilaf? Um, it’s rice with peas and almonds. It tastes like….rice with peas and almonds. I think we can leave it at that. These two recipes are from the “Some Like it Hot” story(?…column?…feature?) in the October 2003 issue. They are all supposed to be based on a classic Mexican food. I generally like the way Everyday Food does Mexican food. Lots of avocado and healthier stuff than beef enchiladas with extra cheese. 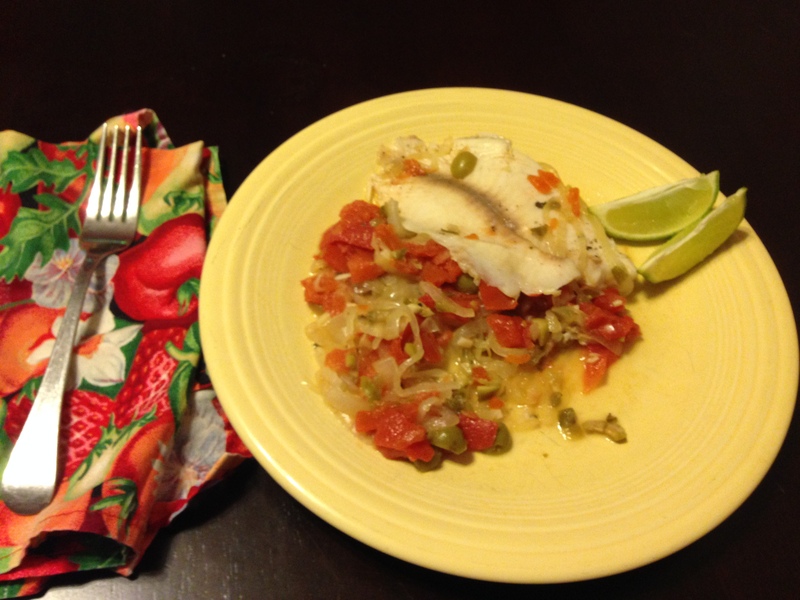 The fish veracruzano called for red snapper, but Aldi carries two kids of fish: salmon and tilapia. So this is tilapia. This was a relatively quick recipe without a ton of prep, and you’ll notice that most of the ingredients keep for a long time. The plum tomatoes are the most perishable thing. Other than that it’s onions, garlic, pickled jalapeños (gotta love a recipe that calls for jarred food), green olives (again, whoo and hoo), dried oregano, fish, and limes. I like recipes that can be made at the end of the week when the more perishable things I shopped for have already gone bad or been used. It’s a tasty recipe with lots of saltiness and tang. If you like olives (attention, B! ), then you’ll like this recipe. On to the beef tacos. It’s difficult to take pictures of tacos. They always look like tostadas. 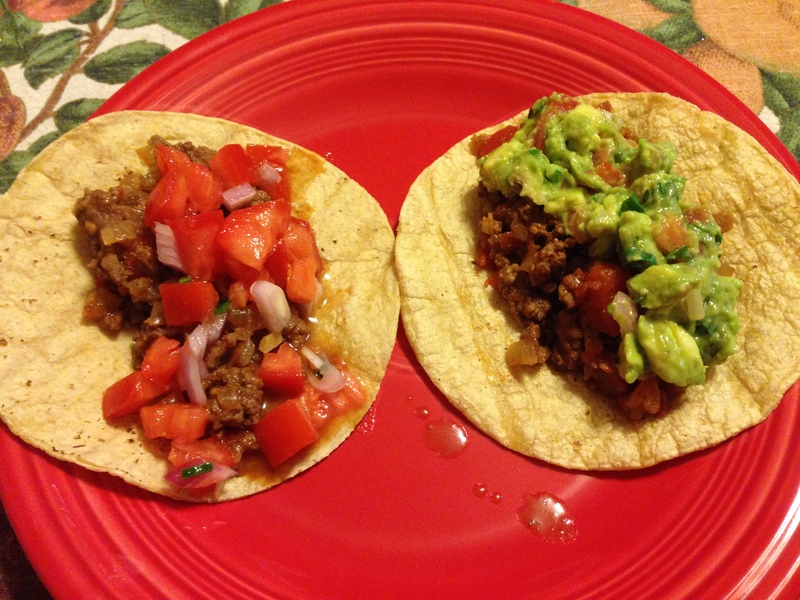 This is three recipes in one: beef taco filling, guacamole, and pico de gallo. 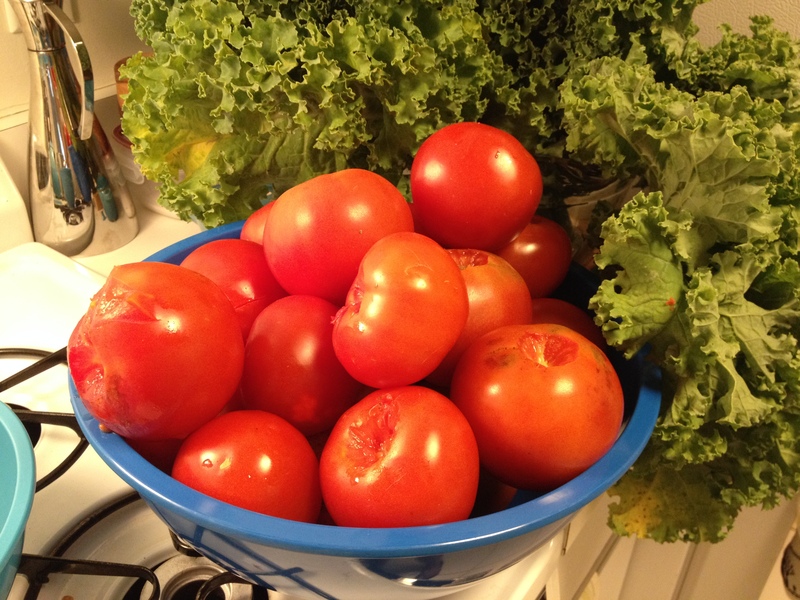 Speaking of letting things go bad…I purchased 7 plum tomatoes for this recipe. The pico de gallo called for 6 and the guacamole called for 1. All but one went bad in the fridge by the time I got around to this recipe. Oops. But I didn’t want to hold off on making this and it was too late to go to the store. 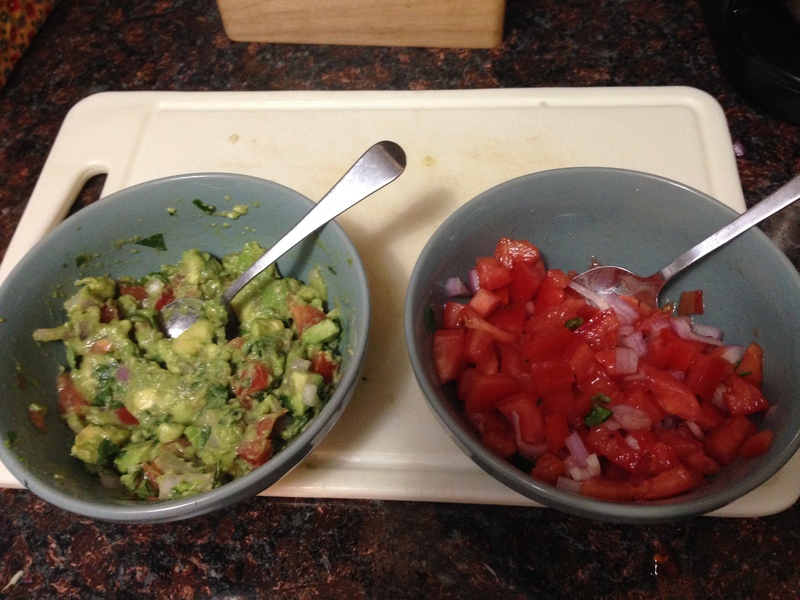 So I made an incredibly tiny batch of guac and an equally ridiculously small batch of pico de gallo. You know what? This was a totally legit option. Sometimes you don’t need a giant amount. This was enough for two adults to garnish their tacos for one meal. It meant we didn’t have them for leftovers, but that’s not the end of the world. 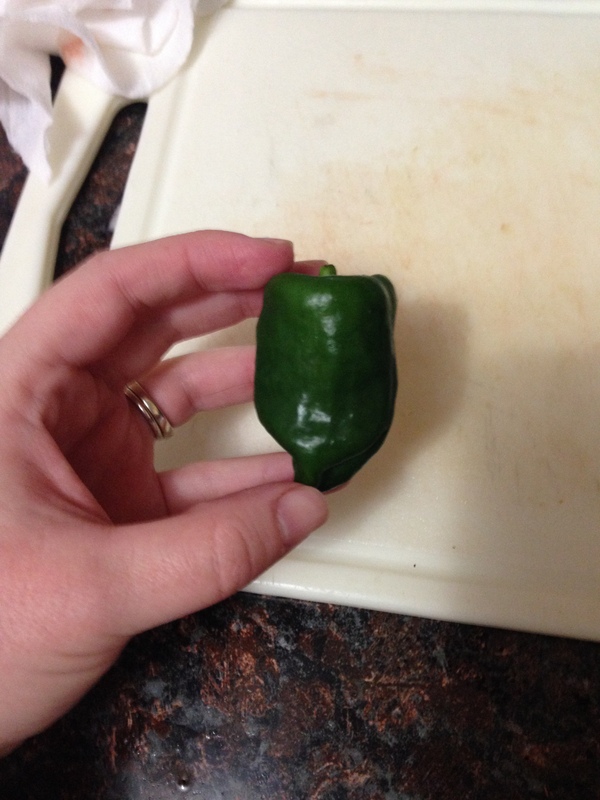 The long skinny pepper has almost zero heat, so it didn’t help much but the Poblano gave it all good flavor. This is a fine taco meat recipe, by the way. I like the freeze it taco filling recipe from another issue better, but this one is fine too. And if you need more heat, may I suggest Valentina. 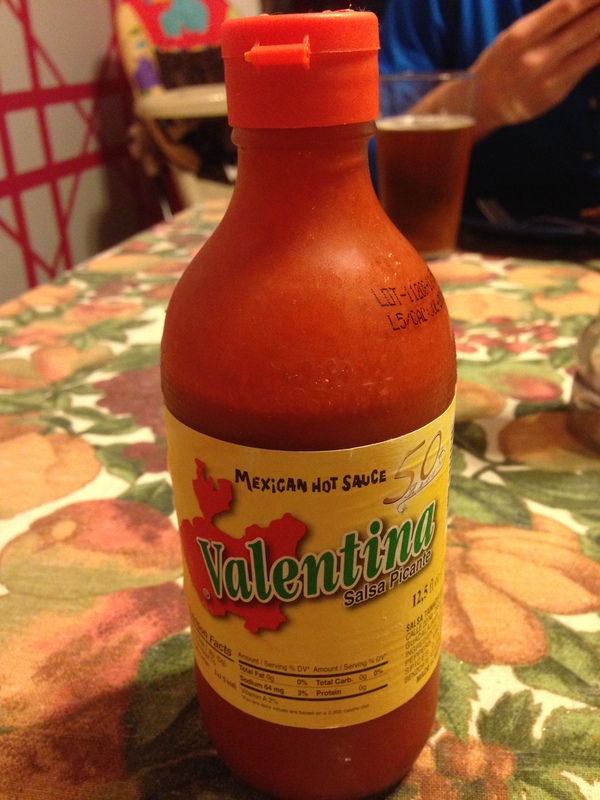 Ah Valentina…the magical $1.00 hot sauce. How are they making any money selling this stuff?! So many tomatoes, surrounded by some truly massive kale leaves. Needless to say, this recipe was one that we struggled to get to. Not because it wasn’t something that sounded delicious, but because it required 10 lbs of fresh ripe tomatoes. This, of course, would be perfect if either of us had a garden and all of our tomatoes were ripening at the same moment. However, neither G nor I have the luxury of what you could really call a yard. And so, we were at the mercy of the supermarket or farm stands (I don’t think they have many farm stands in the city where G lives…). The Bear I live with and I went to see his mother who has access to a truly impressive variety of farm stands and bought a bushel of sauce tomatoes for some insanely low price! She stocked us up for next to nothing with beautiful red tomatoes. And finally, I could take on the daunting task of making this sauce. 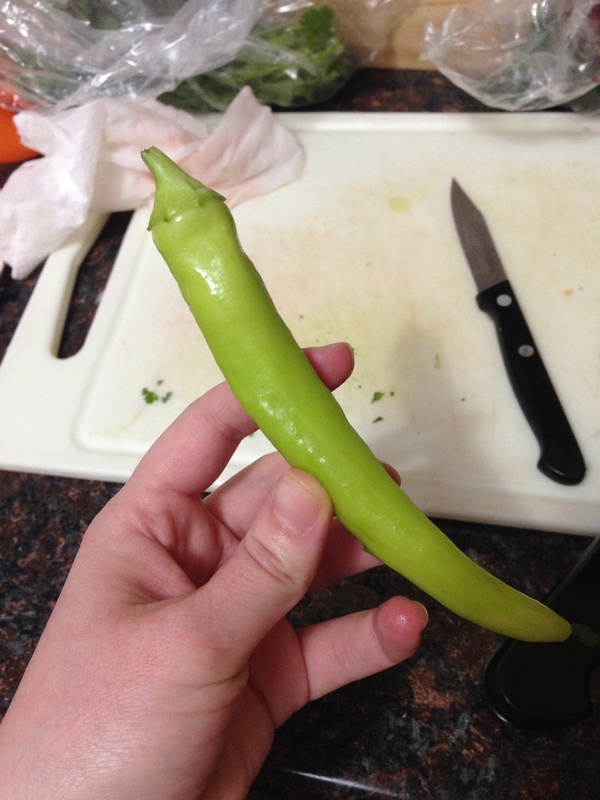 The other issue I encountered with this recipe is the size of my kitchen. 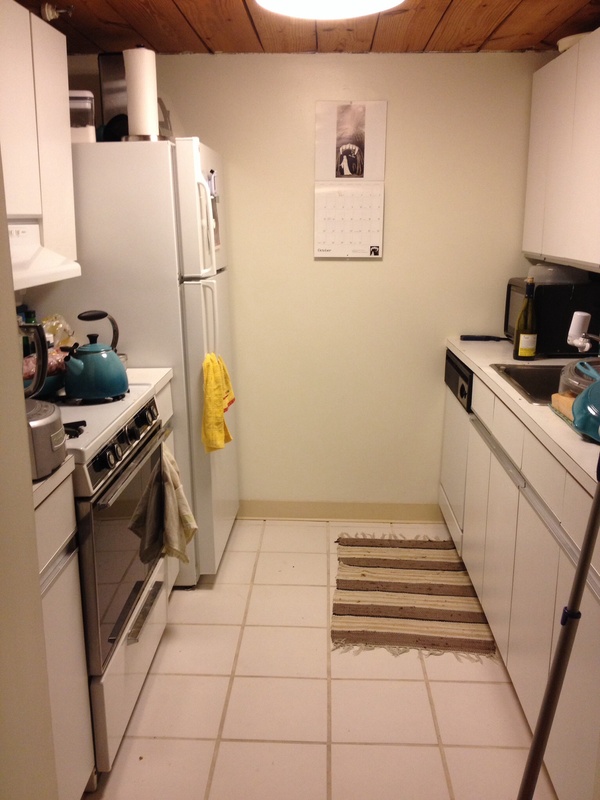 This kitchen is nothing to joke about. Not only do I have next to no counter space, I have nowhere near the amount of cupboard space needed to store my admittedly excessive supply of cookware and kitchen accessories. I have had to rig out an armoire to hold my larger pots/pans and all my tupperware, and took over the coat closet to make a makeshift pantry which also holds my food processor and kitchen aid, as well as a number of baking dishes. Ideally, I would have had a nice big island with a range so I could have set up a processing area. The tomatoes could have gone straight from boiling water to ice bath to sheet pan to cool. Then next to that I would have had a garbage bowl for all the skins and seeds, next to a cutting board, next to a giant bowl to hold all the tomato “meat” before it is returned to the pot with the onions and garlic. Alas! I don’t even want to tell you what my situation looked like but it wasn’t pretty. I think I was just lucky that most of the tomatoes didn’t end up on the floor. 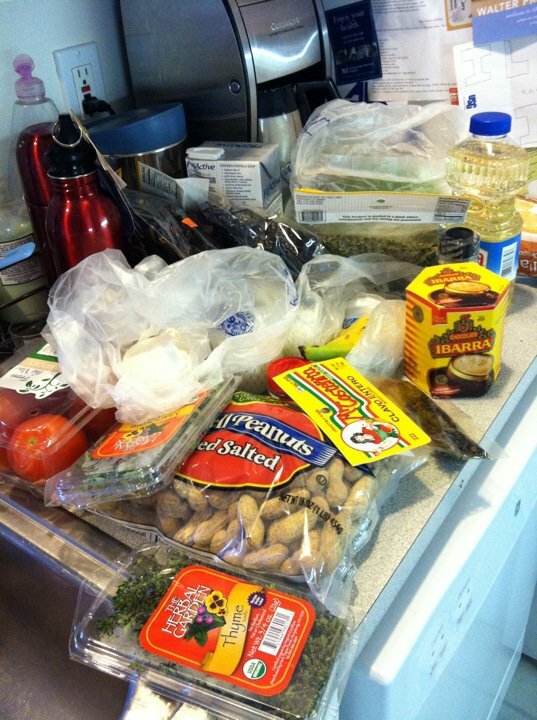 When it actually came down to the recipe the only major alteration I made was adding extra garlic. The recipe called for 6 cloves. I did 10. It was good. It was actually really good. And if not for the whole ordeal leading up to eating it, I would probably make it again. I do think you could make a similar taste by using whole canned tomatoes. 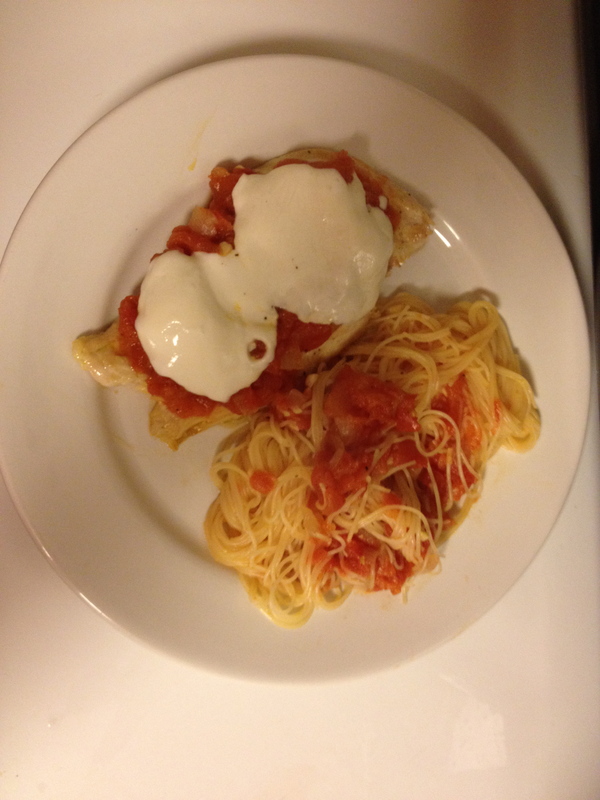 I served that wily sauce with thin spaghetti as recommended in the issue and I also did a quick chicken breast with some of the sauce and a couple slices of fresh mozzarella to make a fry-less chicken parmesan. It was a really satisfying dinner. And it felt quite healthy and wholesome. I sort of wish the process had made more sauce than it did, because after saucing a lb of pasta and my chicken I was only left with about 2 cups so there wasn’t really enough to “put by” in the old fashioned sense. If I do someday end up with an excess of tomatoes, I’ll know what to do with it. And hopefully I will have a better kitchen by then!